Here's a mixed media Home decoration idea - a composition that combines felt and mini-mosaics, 3D effects and soft-textured materials in vivid colors! 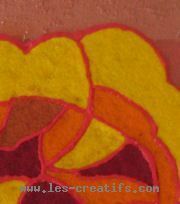 A rose motif (like in some of my other Home decoration canvases) is created by placing pieces of cut felt outlined with 3D paint side by side. 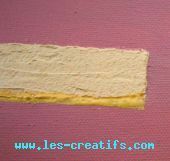 To the top of the canvas, apply a wide strip of texture effect pastethen apply more paste in a rectangle shape, half-way up the left-hand side. Paint the surface (and the sides of the canvas) making full use of the effects you can obtain from the bands of material and shades by combining and contrasting them with the pieces of felt. Beneath the wide brown strip at the bottom of the canvas, glue a straight line of mini-mosaic tiles. Place a few tiles on the strip itself. Outline the top of the strip with 3D/puff paint in a contrasting shade, applying it directly with the nozzle of the bottle (watch out for air bubbles: don't shake the bottle before use...). 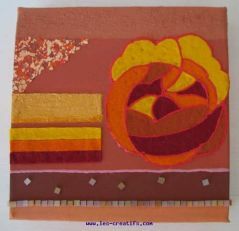 Add a curved motif in flocking fiber/flock to add some range to the variety of geometrical shapes, applying it with all-purpose adhesive or glossy glue/varnish. Draw a rose with big petals and a smaller center. Each area will be reproduced in a different shade of felt. 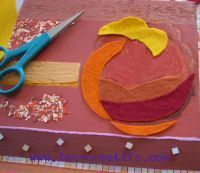 As soon as you've cut out each piece of felt, place it immediately in position to avoid mislaying any individual pieces. Before doing any glueing, ensure that all the pieces fit into place together... To create a matching detail, glue 3 strips of this felt underneath the lefthand 'texture effect' strip. 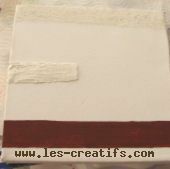 Once the glue has dried i.e, the felt cannot be peeled off), draw the outline of each piece of felt using the red 3D/puff paint. How's that for a weird canvas – you really want to touch it, don't you!